Since travelling to South America last summer, I am totally obsessed with ceviche. If I see it on a menu, I'm sold before checking out any other option. It is just so fresh and light that it really makes the best lunch on a hot day. It is also a great one to impress friends with if you are hosting a dinner, without spending your whole day slaving away in the kitchen. I love to use sea bream as it is less expensive than sea bass and still works amazingly. I've played around with using tuna and salmon too but bream wins my vote. The way that this dish works is that the citrus 'cooks' the fish when you leave it for a number of hours. 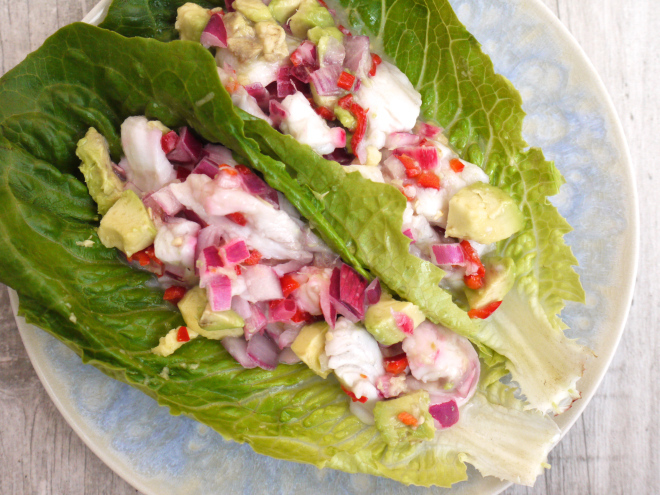 The other flavours are infused into the ceviche to give it a delicious, fresh taste. I usually serve this with a quinoa dish, or just wrapped in large lettuce leaves. It also works really well as part of a tapas style meal or as a starter (in which case the recipe serves four). Finely chop the chilli and red onion. Remove the skin from the fish fillets, and slice them into chunks. I like to cut them so that they take one bite a piece, but you can leave them bigger or make them really fine, depending on your preference. Peel the ginger using a teaspoon then grate it using the fine side of a grater. Add this to a non-reactive bowl (china is fine) with the juice from the limes, the onion and the chilli. Then add the fish pieces and stir well. Cover the bowl with cling film and place in the fridge for about 5-8 hours. Remove it from the fridge and chop the avocado into small chunks. Then add the avocado to serve.